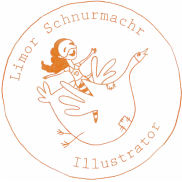 Limor is a professional illustrator and an art director. Lectures and teaches illustration classes for children and students. ​You can read more HERE, HERE and HERE. 2017 Back From the Cold (Group), the Israeli illustration week 2017, Tel Aviv. 2016 Around the Samovar | Illustrating Chekhov (Group), the Israeli illustration week 2016, Tel Aviv. 2015 Eat with your mouth closed (Group), the Israeli illustration week 2015, Tel Aviv. 2015 Still Optimistic: Illustrators in a Tribute to Dudu Geva (Group), HIT- Holon Institute of Technology. 2014 Ilse Kantor Daus (Group), The-Edge Gallery, Nahariya. 2013 Wha﻿﻿les and﻿﻿ Blue Hair - 25 Israeli illustrator (Group), Associazione Culturale Teatrio, Venice, Italy. 2013 Temperament (Group), Hanina Gallery, Tel Aviv. 2010 Legen﻿d of the Child (Group), the Municipal Art Gallery, Raanana. 2007 B﻿﻿eyond the Mirror (Group), Associazione Culturale Teatrio, Venice, Italy. 2006 Math Figure (Group), the Bloomfield Science Museum, Jerusalem. 2006 Games (Group), the Municipal Art Gallery, Raanana. 2005 Clowns, Fools and Jesters (Group), Bet Ariela, Tel Aviv. 2004 Cinema- Illustrations of Movies Blockbusters (Group), Cinematheque, Tel-Aviv.